Many people associate cream of mushroom with Campbell’s-assisted casseroles. I did not grow up with these, so got to discover them as an adult (along with butter and cream). But that handy concentrated glop, even diluted, is nothing like cream of mushroom from scratch. I even convinced Chris of this fact, with this recipe. 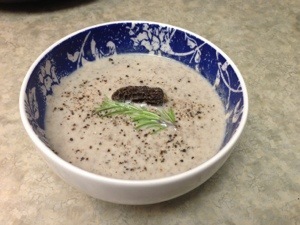 It’s loosely adapted from 500 Greatest-Ever Vegetarian Recipes‘ wild mushroom soup.